The club was founded in 1952, and an important event is the annual Anzac Day parade to lay wreaths at the plaques on Lion Rock. 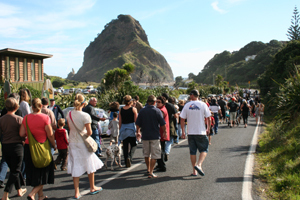 The Anzac Day parade is held every 25 April, commencing at around 1.45 pm from the RSA in Beach Valley Road. The parade is piped down to and across the beach, where a service is held, wreaths are laid and a bugler plays the Last Post. Quality food at reasonable prices. Blackboard menu changing weekly, including vegetarian and children’s meals.